I’m going to be dead honest with you. Running a blog is tough work. Sometimes I ask myself why I ever started a blog. 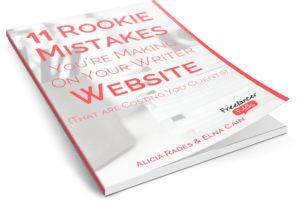 Yet when you’re just dipping your feet in the water, it seems like every freelance writer has a blog and that it’s some sort of “right of passage” or the only way to land clients. For a long time, I didn’t have a blog, and I was still landing clients. I only started this blog due to my interest in helping other freelance writers. Let’s get right down to it. The answer is no, you don’t need a blog. Lots of big-name freelance writers like Linda Formichelli, Carol Tice, and Sophie Lizard monetize their blogs or sell other services to freelance writers. Essentially, it’s part of their business. But you don’t have to target your blog to freelance writers only. I’ve seen plenty of freelance writers start their own beauty or travel blogs and make money from selling eBooks, online courses, or ads. The truth is, though, that you generally need a strong community to make money off your blog, so if you’re looking to start a blog right off the bat just to make money off the ads, you’re probably better off putting time into client work so you have some money coming in. That’s not to say that you can’t start making money right away and quickly build a community. If you know what you’re doing, then dive right in! Blogs aren’t all about making money directly through eBook and ads. A blog straight on your writer website can help you sell your writing services. Google likes frequently updated sites, and having a blog keeps your site fresh. I personally have a blog on my writer website that I update twice a month, and most of my clients come to me via search engine. I can’t say if my blog is the sole factor in that, but I won’t argue that it probably helps. If you are going to start a blog for SEO purposes, be sure you’re targeting your ideal client. Lots of writers will talk freelance writing or blogging, and that’s okay, but you could also talk travel if you’re a travel writer or health if you’re a health writer. Just like how blogging can help you land clients via search engines, it can also help you attract attention through social networks. After all, who’s going to be sharing your Home or About pages? Instead, they’ll be sharing your blog posts. Through this, you can connect with clients directly or with fellow writers, which can lead to referrals. As mentioned, having a blog can help with SEO, but that’s only ONE factor. You don’t need a blog to rank well on search engines. If you’re concerned about updating your site frequently–because Google likes up-to-date websites–then adding a new clip to your portfolio every now and then could have the same effect. Blogging for the sole purpose of getting clips is not all bad, but it’s not very impressive, either. Lots of writers start out with a blog right off the bat because they want to show clients they have samples. The truth is, though, that clients are likely to be more impressed if you’ve been in another publication. The least this does is shows that you’ve worked with clients in the past. So what do you need to do to get those clips? You could start by guest blogging, and there are plenty of sites that pay for guest posts. Or you could write marketing copy for your friend’s business. If you’re okay with writing for free to begin with, volunteer at a non-profit. Simply put, the answer is no, you don’t need a blog. However, some writers do find that it fits well with their business goals. In the end, you shouldn’t be asking, “Do I need a blog as a freelance writer?” You should be asking, “Will a blog benefit me or my business?” If you don’t want to take the time to do it or don’t feel like you have enough ideas to populate a blog, then perhaps other marketing methods will work better for you. So, do you think you’ll start a blog? Why, or why not? Let us know in the comment section. Great post. I still think you do need a blog if you’re a freelance writer or blogger. I sort of see it as, part of your persona. I mean if I went to a dentist with teeth like Austin Powers, would I think he’s credible? Not really. Or, if a doctor busts out smoking, is he really a doctor that understands the body? You make a really good point, but I guess it depends on what type of writing you’re doing. If you are, in fact, a blogger, then it makes sense. But even then you can showcase your writing to clients by the content you’ve provided to other publications. I DO think it’s a good idea, but I don’t think it’s necessary for all writers. Definitely! That is one thing I forgot to mention above. I agree that a blog isn’t essential when starting out. I’m just starting out and find that maintaining a blog is keeping me from marketing. Thus, I cut the blog from my website and I’m focusing on guest blogging as a marketing tactic. So far I think it’s working. Awesome. I’d love to hear more about how that goes for you! Thanks for writing this post, Alicia. It has been much awaited on my list. :). I would incline more towards building a community or audience before you start a blog. And I believe, Guest blogging is one the easiest ways to do it. Though it helps in branding, but if you don’t have your tribe, and the required engagement ( social shares, comments, etc.) even quality content doesn’t pull the readers to your blog. After all, who would like their blog to be an idle territory. Isn’t that so?